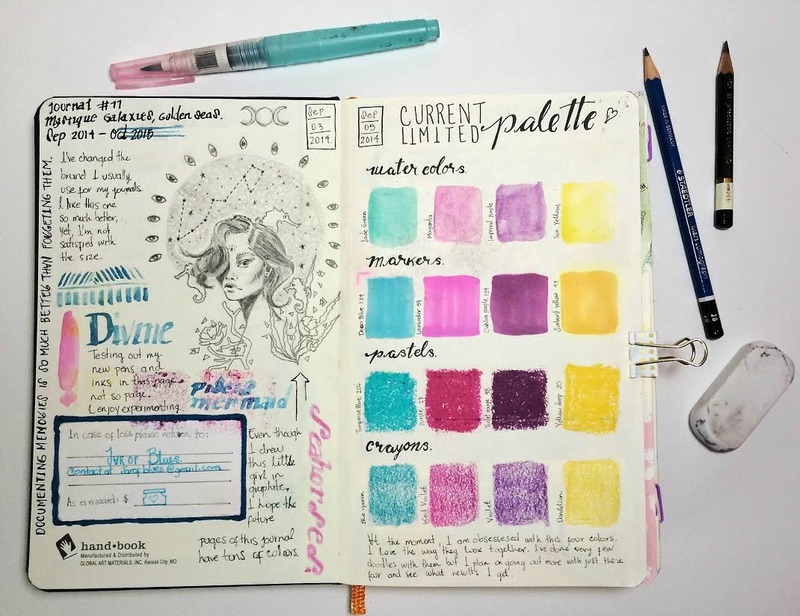 The Journal Diaries is a blog segment where we get a sneak peek into the journals, notebooks, organizers, and diaries from creative souls all over the world. My special guest today is Sandy from Columbia. - Hi Sandy, and welcome! Tell us a little more about yourself! Hi lovelies! My name is Sandy but I sign all of my work under Jar of Blues. 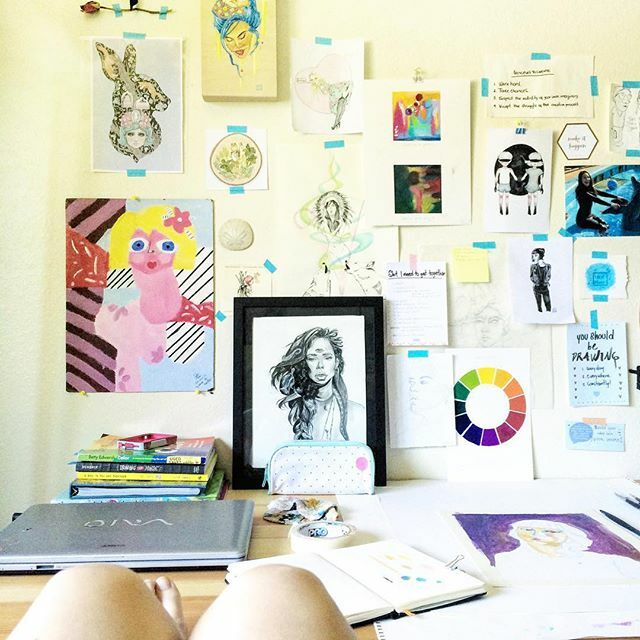 I’m a 23-year-old creative soul from Colombia, currently residing in Portland, Oregon. As a young female from a culture that doesn’t empower women to be fully self-expressed, I struggled a lot with depression and fear. However, these 5 years I’ve lived in America have been an incredible experience; here, I gained the freedom to explore who I am, express it without the worry of being judged and ultimately, reached completion with my past through art. Because my sanity, my happiness and my life improved since I started making my craft a priority, I am very passionate about prioritizing creativity, and I want to share the journey of creative living with others and support them to fulfill their artsy dreams just as I’m fulfilling mine. In the meantime I spend my days being a part-time server, painting and giving love to my two cats, my partner and my family and friends. We’re a little tribe of passionate people who love living! It really all began at a very young age. At first I was only writing in diaries to express my thoughts freely, without the pressure of having to measure my words as I had to do when talking to my parents, family and friends. But I only came to become passionate about journaling around fifth grade, when we were doing a family tree for our biology class, and the curiosity about my ancestors aroused in me. I wanted to know how they lived, their memories, their stories; I wanted to see the world they lived in through their eyes. Nobody seemed to have kept records, though, and if they did, their notebooks got lost in time. I grew very frustrated because my family is immense and I’m willing to bet there are a zillion of wonderful stories they all could tell. So one morning I woke up, and decided that I didn’t want the same situation to happen to my descendants, and I made I vow to myself to keep journaling until the end of my days. There’s a big chance none of my descendants will be interested in seeing what my generation looked like, but someone will, at some point, I hope, and when that occurs, my notebooks will be here, waiting for them. 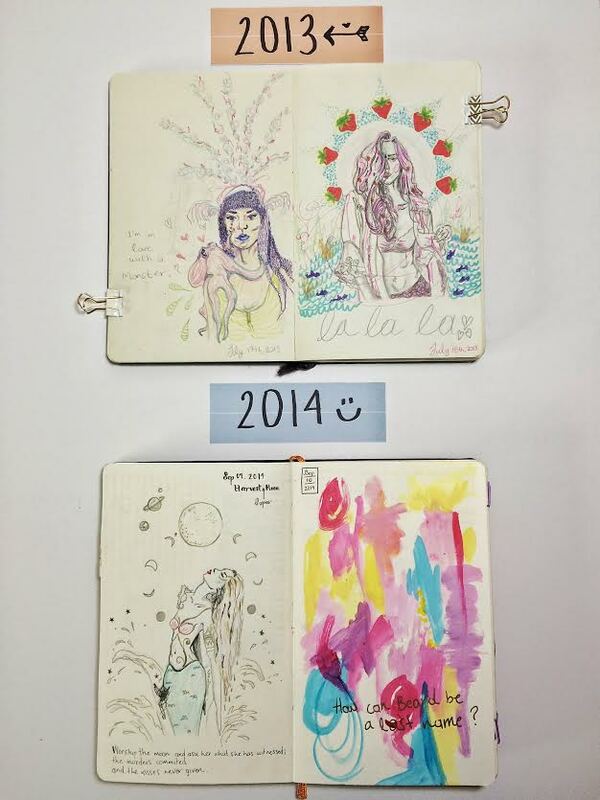 - Would you say that you have been pretty consistent with art journaling throughout the years? Nope. 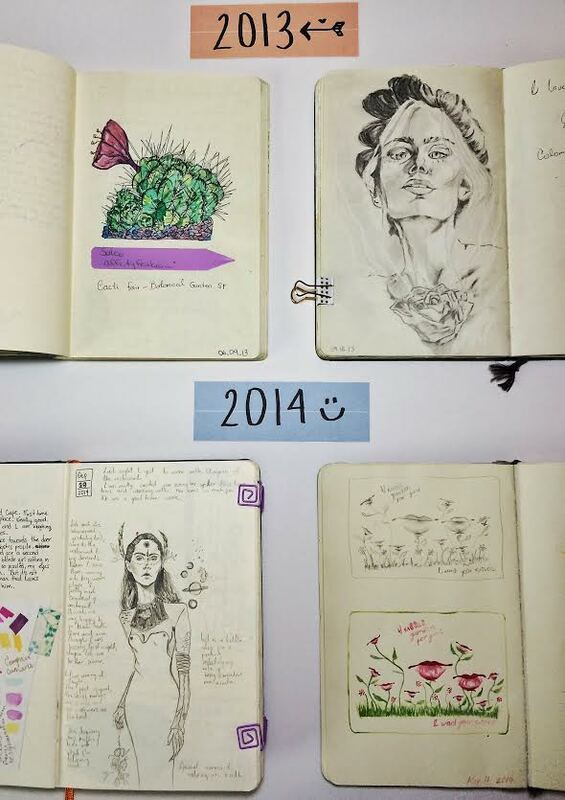 I’ve reached some deep creative ruts in my life in which I’ve gone months without touching a journal or sketchbook. Fortunately, though, I’ve always found my way back to journaling (maybe because of my vow and promise to my descendants?) and in recent years, I’ve discovered that during the times I’m the saddest or struggling the most, I don’t journal at all and that is precisely why I can’t get out of my depression. In that process, I realized that I need to create in order to keep myself balanced and sane. 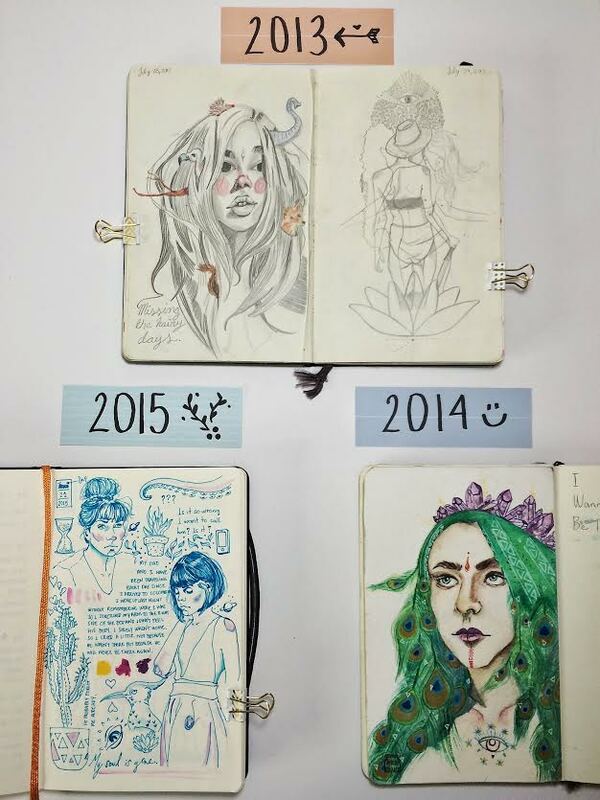 So journaling isn’t something I can just give up on, I might lose my way every now and again but I will always return to my home, my sketchbooks. Definitely! 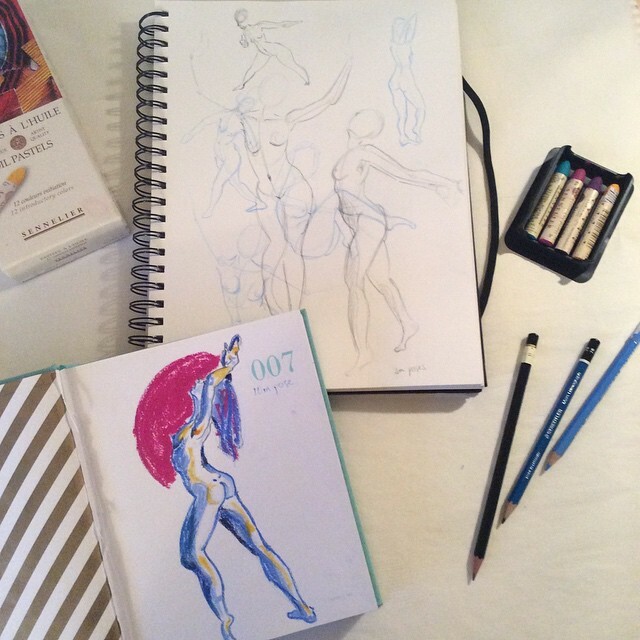 I was just reviewing all of my journals and I noticed that, although my interest for the female form and sensitivity have been very consistent through my work, I’ve allowed myself to experiment a lot with my lines, my colors, my forms, my media, in order to not only learn and get better but also, to find an artistic style I’m fully comfortable with. So truth be told, my style will keep changing until I find that one style that screams my name and even then, I might change, so my style might change again. It’s all really just a game of experimenting and enjoyment. I mean, if you go through Picasso’s artwork chronologically, even his style changed constantly! - What inspires your work and creativity the most? Something that keeps coming up in my art is the female figure. I’m obsessed with my gender; our human form, our emotions, our way to connect with nature, with men, with other women, our sexuality, everything. That is my main source of inspiration and I want to record as many observations about women as I can. Nonetheless, I like to get my ideas flowing sometimes, from photography, films with very little dialogue such as “In The City of Sylvia,” poems and daily events that occur during my bus ride. I definitely prefer very loose lines and splatters in my journals. It’s a little bit of a mix between mixed media, figurative, abstract and text. Sometimes, I put a bit more effort than others, but I find it more enjoyable when I’m not worrying about whether it’s good or not, as it tends to happen with my sketchbooks and paintings. Pressure is not something I want in my journals, they’re personal, and therefore I allow myself to be free with them. - Is there a particular time of day that you find yourself more creative? Oh yes. I love sitting on the floor right past midnight and staying awake all night doodling and making art. My little genius is a bit of a maniac and hits me up with inspiration at the most inappropriate moments. However, staying up late had started to wear me down, so for the sake of being healthy, I’m creating habits and getting out of my comfort zone by sitting down to make art in the morning and early afternoon even when inspiration doesn’t strike. If I want to have a balanced creative life, I really need to start using my nights for sleep and my days to create, so lately, creativity finds me working, I don’t wait for inspiration anymore. So far, from all the brands I’ve used for journaling, I really love the Hand Book Artist Journals. I like that their set up is similar to the Moleskine sketchbooks, however, the quality of the paper is a little bit better; they’re sheets are 130 gms, acid free and have a light toothy surface so the pages don’t get all wobbly after using watercolor or acrylics. Also! Another really nice feature is that, these journals’ envelopes are made of clear plastic, which makes me feel a lot more secure about how safe my little memorabilia and souvenirs will be! The only con I find on this brand is that the hard bound cover is protected with cloth and since I title my journals, it’s hard to find a medium that will stick on it. But this is not a big deal, I’m a resourceful lady, I usually figure it out. 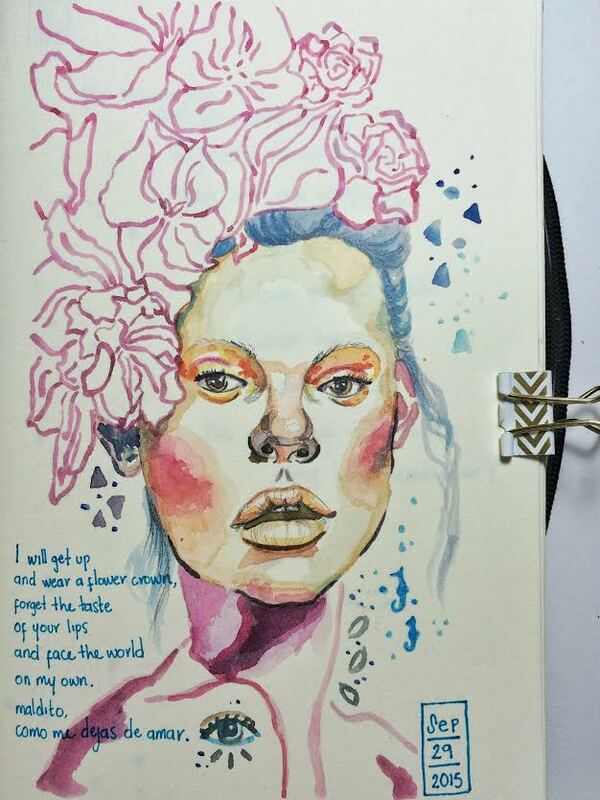 When it comes to journaling, I mainly use graphite, watercolors and microns. Here and there though, you will find collages, oil pastels and acrylics, sometimes I use very cheap calligraphy pens for writing. It all depends on how I feel at the moment of putting thoughts onto paper and what media I think will better represent those thoughts. My favorite color is gold! But in my illustrations I use mostly light blues, turquoise, magenta, purple and yellow. I think I’m trying to make that my permanent palette for everything but it’s causing me a lot of trouble to figure out a way to make it work smoothly. I’ll get there though. I’d say that maybe the one thing people would be surprised to know about me is that in 2010, I kept a blog about my short stories and I even wrote half a novel! I felt good about it, especially after winning three writing awards three years in a row but, somewhere in time, I lost confidence and I took the website down. Since then, I don’t really share my writings with anybody anymore or tell anybody I can actually write. It’s a bit sad. 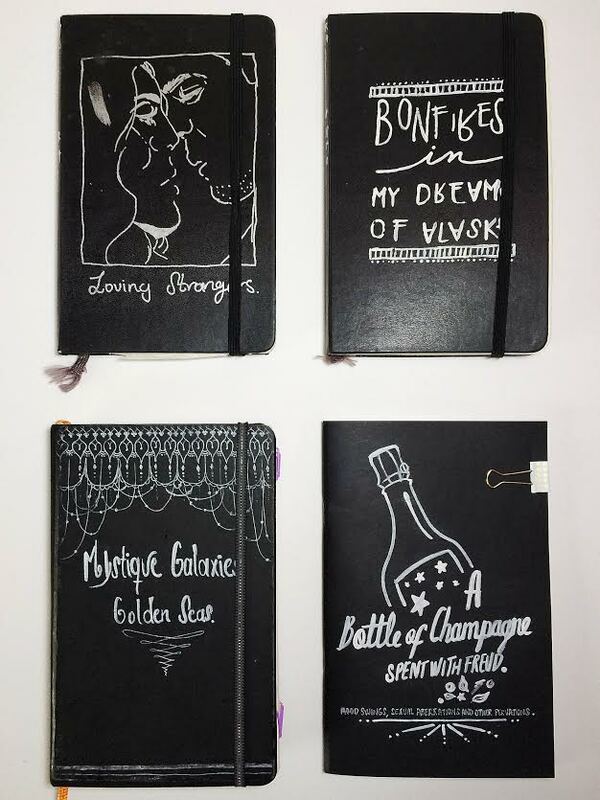 - What advice, tip, or suggestion would you offer to anyone looking to start their own sketchbook or illustration journal? To anyone looking to start their own sketchbook or journal, I know that the blank page is beautiful, but it’s gonna be gorgeous once you’ve made some marks on it. So stop looking at it, tell fear to move aside, pick up some crayons and doodle on it. If you’re really terrified by that new notebook of yours, skip the first page! Seriously, do it. Make your art for the process, not the outcome, if the outcome is not to your satisfaction, don’t you worry, it’s going to be okay, and you will survive. Oh! And for the love of the universe, share that beautiful page you just made, we all want to see it! I am obsessed with photography, although I don’t practice it much, I do love playing with it as frequently as I can. I own 5 Polaroids from different decades and have two other analogue cameras with film instead of Instant paper. I also like to invest some of my time on planners, checking little goals off my to-do lists, and writing letters. I like to collect seashells, leaves, pine cones, anything I find in nature and I can take with me home as a souvenir from my adventures. Lastly but not least, I like writing short stories, filling out photo albums, baking cookies, blogging, dancing, and exploring new places. 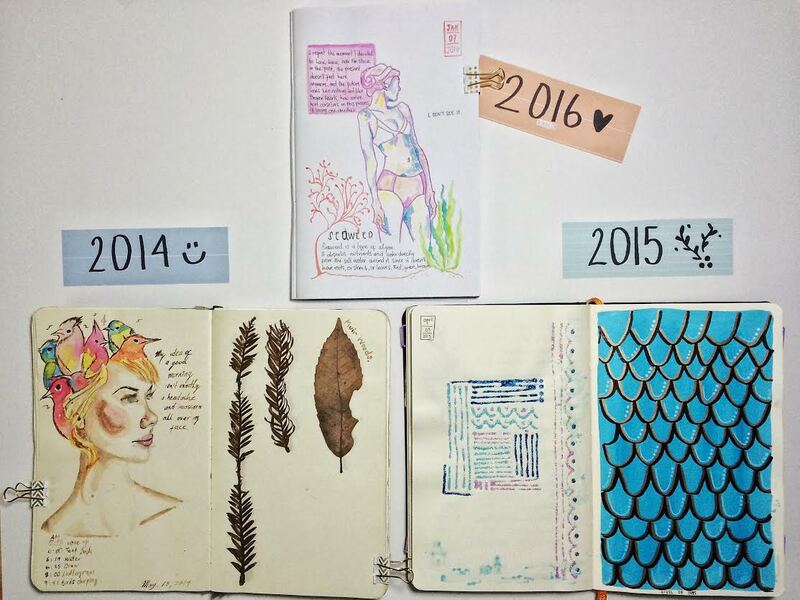 Thank you so much, Sandy, for sharing your art journalings and sketchbooks with us! Amazing advice to newbies! Love this series!